Nuclear has been responsible for 45% of recent increases on your electricity bill. Meanwhile, the impact of renewables on your electricity bill has been minor – about 6%. I responded at the time as the statement, and the misunderstanding of Ontario's convoluted pricing that lead to it, were nonsensical. However, I thought I'd pull some quick figures to bludgeon truth in demonstrating how much cheaper nuclear has become, while the costs of renewables, and their friend natural gas, have skyrocketed. And then I'll try to add a more accurate perspective. 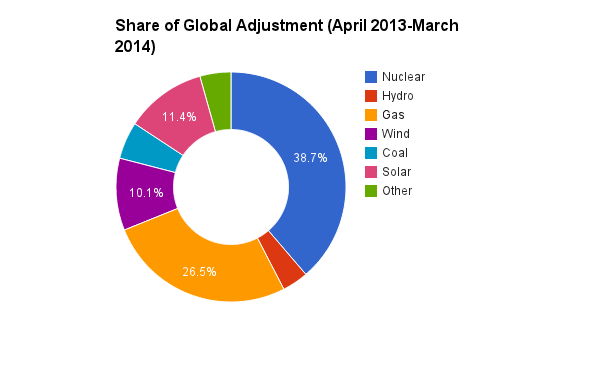 I estimate figures on an ongoing basis and, according to my calculations, nuclear generation is responsible for ~38.7% of the global adjustment mechanism (GAM) charges over the most recent 12-month period. That statistic is well down from the 45% Greenpeace sited. What is escalating during this decline in nuclear's share? Solar and wind generation is now up to 21.5% of the GAM, from the 6% cited less than 2 years ago. Share of the GAM pot just doesn't seem meaningful without the share of supply being provided - so I've shown that too, as a second doughnut. 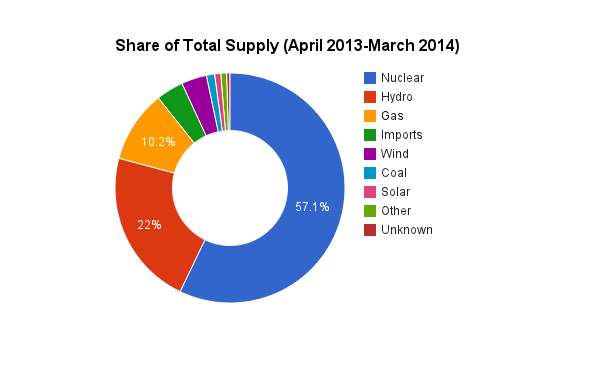 Nuclear provided 57% of all supply during the12-month period, but was responsible for less than 39% of the GAM pool. Wind produced 4% of supply, but the estimate is it's responsible for 10% of the global adjustment charge; solar generated only 1% of supply which caused 11% of the GAM. My estimates may seem outlandish in terms of the narrative one gets from the promoters of renewables, but they are perfectly in line with figures shown in the last document behind regulated pricing plans in the province, which showed wind and solar each expected to comprise 11% of the global adjustment. (table 2, page 20). There's silliness in interpretting this approach as indicating "subsidy" level. I chose to write this post, and pull the figures for it, because the Hourly Ontario Energy Price (HOEP) was as high in each of the past 3 months as it had been since 2005; higher than the contracted price of nuclear, but lower than the contracted price of wind and, of course, solar. In reality little has changed; the share of the global adjustment is as influenced by the funds recovered by sales at the market rate as it is by the contracted cost of supply: it's just the difference between the two. Nothing unexpected has happened in the past 2 years. Added variable Renewable Energy Sources (vRES= wind and solar), which lack capacity value, will either bump nuclear or hydro generation, get exported at cheap rates, or displace production from the natural gas generators that are paid regardless of production. The final of these scenarios is desirable, in that burning carbon is avoided - but it does have a cost impact that shows as a higher per unit cost of generation from natural gas generators. If we group production and costs to calculate the total for the combination of wind and solar and natural gas, the production is 14.6% of supply and the cost 31.9% (over this period that results in an estimated 48% of GAM charges). There are ways the size of the GAM charges inflate consumer pricing in Ontario. The very high HOEP over the first 3 months of 2014 appears to have tempered the rise in the commodity price (comprised on HOEP and class B GAM); that rate increased by 17% in 2013, but only 6% in the first quarter of 2014. This is due to more of the cost of supply being paid by export customers (excluded from paying any GAM costs) and class A customers (who can save most of the GAM costs).